1. Thaw shrimp, if frozen. Peel and devein shrimp, leaving tails on if desired. 2. In a small bowl, toss together shrimp, oil, garlic, lemon peel, and pepper. 3. Place a steamer basket in a wok or large skillet with a tight-fitting lid. Add water to just below the basket. 4. Place shrimp in a single layer in steamer basket. Cover and place over medium-high heat. 5. Steam for 5 to 6 minutes or until shrimp are opaque. Remove shrimp and keep warm. 6. Meanwhile, wash spinach. Arrange spinach evenly in steamer basket. 7. Cover and steam about 2 minutes (start timing immediately) or until wilted. Divide spinach between two serving plates. 8. If desired, thread shrimp onto 6- to 8-inch wooden skewers. 9. 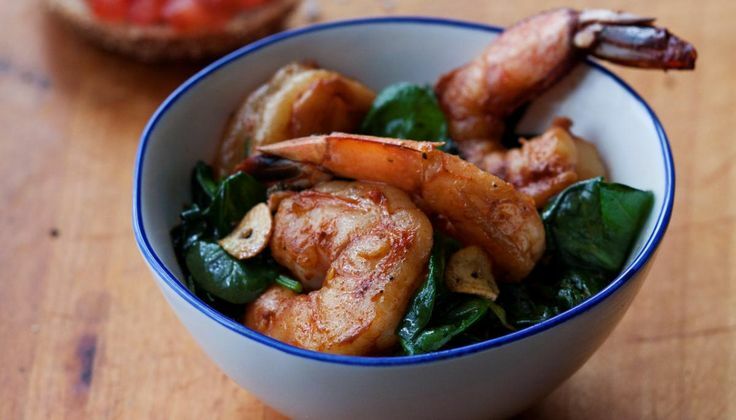 Place shrimp on top of spinach. Sprinkle with Parmesan cheese. Serve with lemon wedges. Makes 2 servings.